University of Nevada, Reno, Department of Art: "The Press' publishing and outreach activities are integrated with the graphic arts curriculum. Historical printing equipment lives alongside computers and other digital media used in our teaching, publishing, research, and outreach programs. "Founded in 1965 by Kenneth J. Carpenter, the Black Rock Press has focused on the practice and teaching of the art, craft and history of the creation of finely printed books. The Press is a working museum of traditional printing technology. It houses numerous type cabinets filled with metal and wood type and a number of historically significant presses. Its gilded 1837 super royal Columbian is one of the finest examples of a 19th-century iron handpress to be found in the United States. In 1980, Bob Blesse took over directing the activities of the Press. Over the course of 30 years, he expanded the area of publication into finely produced editions of creative writing and poetry." Reno, Nevada: Black Rock Press, 2016. Edition of 50. 6.75 x 4.375"; 16 pages including covers. Letterpress printed from handset metal type and photopolymer plates on Rives BFK. The typefaces that appear in the book are Craw Clarendon and Clarendon. 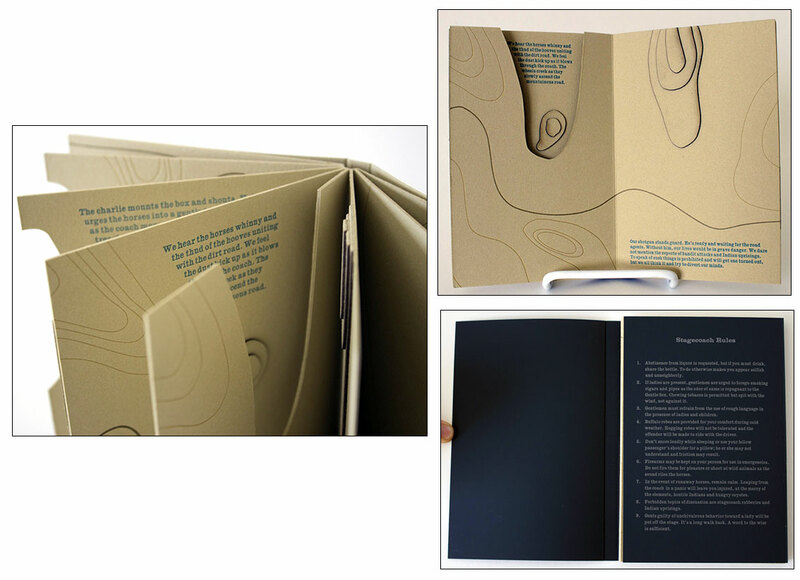 The book is handbound in a drum leaf structure and presented in a paper wrapper and slipcase. Laser cut on an Epilog Helix 24 Laser Cutter and handcut by the artist. Signed and numbered by the artist on the colophon. Jamie Shafer: "Created as part of my experience as the Black Rock Press Redfield Fellow in Book Arts at the University of Nevada, Reno, Old Geiger Grade is the first book produced by the Black Rock Press for the Parley Project. The Parley Project is a biannual interdisciplinary book art project that engages other entities within the university in conversation with the Black Rock Press. It was influenced by the W.M. Keck Museum at the University of Nevada, Reno—the second oldest museum in the state. Special thanks to the staff and students at UNR who assisted with production: Inge Bruggeman, Amy Thompson, Amaris Martin, Judith Rodby, and Su Tran. 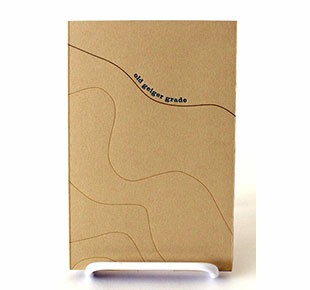 "Old Geiger Grade was inspired by Geiger Grade Road and the history of the Comstock. It places readers in the steep, dangerous terrain of the 1860s as they travel to Virginia City where they hope their fortunes might be found." nevadalandtrust.org: "Next time you’re headed up to Virginia City from Reno on Geiger Grade, NV 341, check out the Nevada State Historical Marker just before the road flattens out in the Highlands. The sign tells of the Old Geiger Grade (‘In Canyon Below’) constructed by Davison Geiger and John Tilton in 1862 to link Virginia City’s Comstock Lode to the Truckee Meadows." Reno, Nevada: Black Rock Press, 2016 - 2018. Edition of 50. 11.5 x 14.5"; 22 leaves. Printed on glassine. Bound in cloth over boards. Front board partial cover in glassine with cut-out title letters. Paper four-flap portfolio envelope on back pastedown. 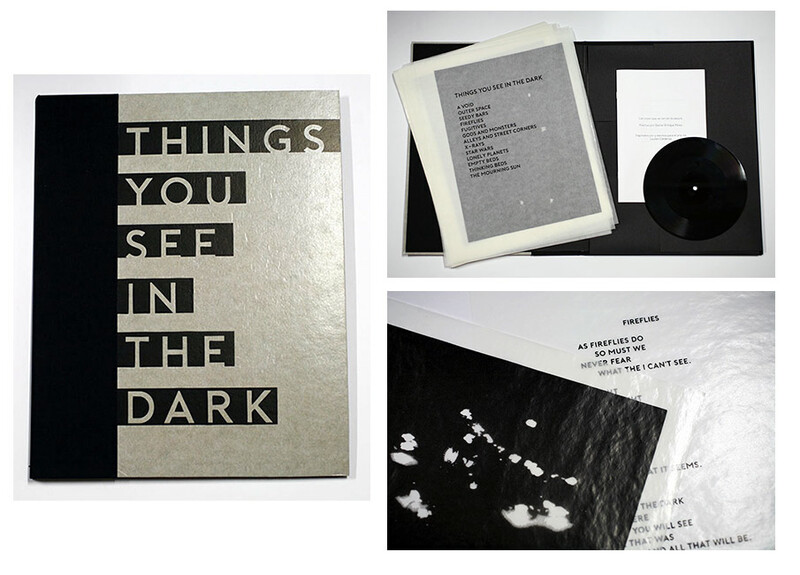 Laid in are 6.75" vinyl soundtrack and pamphlet (6 x 9", 20 pages including wraps; stapled; text in Spanish and English). Signed and numbered by Cardenas. 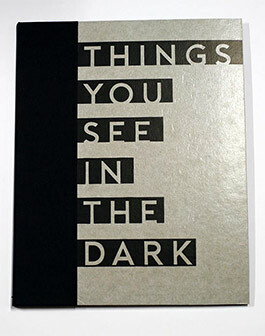 Black Rock Press: "Things You See in the Dark, a Parley Project created by the 2016-2018 Black Rock Press Redfield Fellow, Lauren Cardenas, is a collaboration with Daniel Enrique Perez, an Associate Professor of Chicanx and Latinx studies in the Department of World Languages and Literatures at University of Nevada, Reno and David Kirkland, a DJ based out of St. Louis. The Parley Project is a biennial interdisciplinary book art project that fosters research and conversation across the UNR campus and involves BRP students, staff, and faculty in its production. "Things You See in the Dark is a visual, tactile, and auditory experience that pays homage to the uncertainties one might experience in the dark. Composed of a suite of prints and poems, along with a vinyl soundtrack, this artist book invites the viewer to slow down while meditating on the elusive nature of the dark." Lauren Cardenas, artist's statement: "Things You See in the Dark is an homage to the quiet subtle moments found in a veiled aperture. This tranquil space gives permission for close encounters with faint whispers and soft embraces that may illuminate the warmth of one's inner being (pneuma). … In the dark I find solace, believing it is a space where one may become acquainted with the unknown." Lauren Cardenas is a Texas native and studio artist who focuses on print media. She is an Assistant Professor in Printmaking the University of Mississippi. Daniel Enrique Perez, director of the Core Humanities program and a faculty associate of the Gender, Race, and Identity program, at UNR: "I hope the poems I wrote for this collection evoke the full range of sentiments I felt when immersed in Lauren's work. I was interested in capturing that tension between intimacy and distance. I wanted readers to have some of the revelations I had when delving into the images and making discoveries about the past that helped me understand the present. I also wanted to leave readers with a sense of hope – that glimmer of light that is always present and leads the way to alternate spaces, other realms, and other dark spaces." Reno, Nevada: Black Rock Press, 2017. Edition of 70. 7.25 x 13.5" box containing two items: "Selected Durations" and production notes. Letterpress printed from photopolymer plates on Yuo Synthetic Paper and Neenah Touché. Numbered. 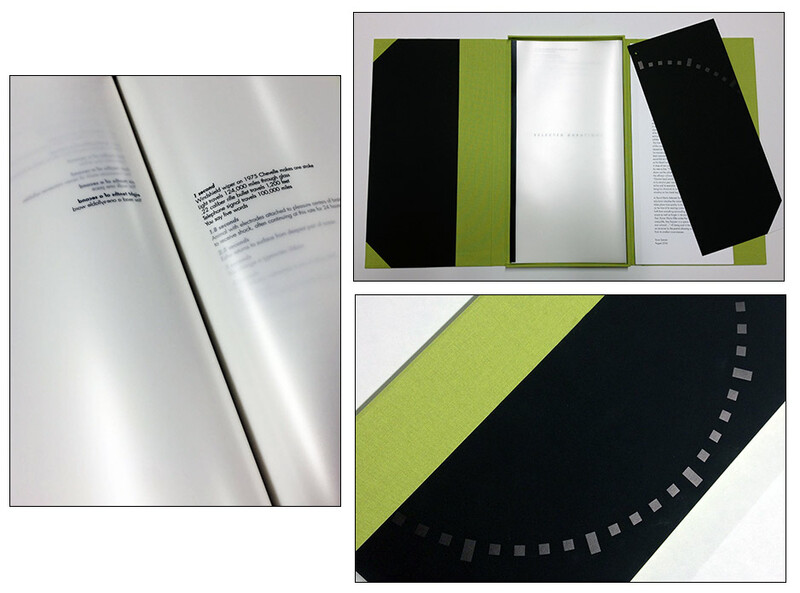 "Selected Durations": 25 leaves plus wraps; rubberized snap binding. Colophon: 5.5 x 13"; 5 leaves; covers in black; bound with ring hole upper left corner. Laid in tray box covered with black paper and green cloth. Black Rock Press: "'Selected Durations' by David Abel is simultaneously a poem and a score for performance that captures, analyzes, quantifies, and archives time. 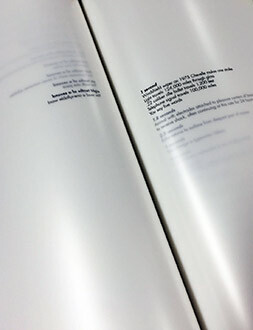 The kinesthetic and material qualities of this artist's book embed Abel's text in multiple layers of meaning, requiring the reader to perform the experience of the passage of time, which ticks away with each turn of the page. "The publication of 'Selected Durations' was prompted by the author's performance of the piece in a BFA Seminar in the Department of Art at the University of Nevada, Reno, taught by Inge Bruggeman. Experiencing the pace and the compression of time in the reading led Inge to propose that the text be editioned. Beginning with a prototype originally created by artist Katherine Kuehn, the Black Rock Press reimagined the work, bringing it to life in the hands of readers." David Abel, Author's Note: "The text for the piece was taken from a reference book in my personal library: 'Durations: An Encyclopedia of How Long Things Take' compiled by Stuart A. Sandow, Chrissie Bamber, and J. William Rious (Times Books, 1977). Selected entries were lightly edited and then the list winnowed to the requisite overall length. In addition to the vividness, incongruity, mystery, and sometimes slapstick effects of the facts taken out of context (and the way in which this seemingly random sample nonetheless served to characterize a culture), I was intrigued by additional layers of temporality embedded in the text – the likelihood, for example, that many of the statistics must have already been out of date by the time I cobbled together the score."